Apple has officially named long time director of public relations Steve Dowling as its new Vice President of Communications, as noted on the company’s executive bios webpage. Dowling succeeds former Apple Communications head Katie Cotton, who left Apple in 2014 following Apple CEO Tim Cook choosing to take Apple in a new direction PR-wise. Dowling has led Apple’s Communications division for several months following Cotton’s departure, and he was internally named interim head of PR last October. Following the departure of Cotton, Apple’s PR strategy has been more open, with the company commenting more frequently on various news matters and seeding product review units to more news organizations. Dowling has been seen alongside Cook at various media appearances across the world. Last year, we published an extensive profile of Apple’s PR, Communications, and Marketing department, noting that Dowling would likely become Katie Cotton’s official successor in the near future. Apple has posted a note on its official Investor Relations website to indicate that it will be holding its Q3 2014 earnings results announcement and conference call on Tuesday, July 22nd. The call begins at 2PM PT/5PM ET, and Apple usually releases the numbers in the form of a press release around 1:30PM PT/ 4:30PM ET. This upcoming call will be the first under new CFO Luca Maestri, and he will likely be joined by Apple CEO Tim Cook on the call. 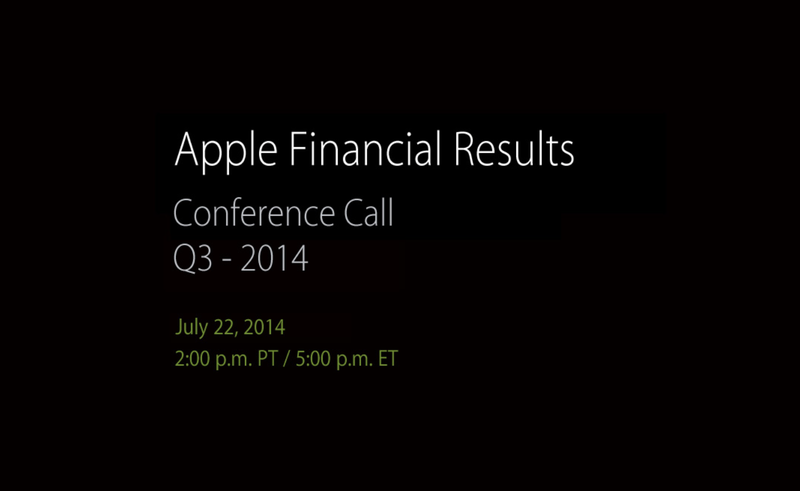 We’ll have live coverage of the earnings results and notes of interest from the follow-up conference call. In an SEC filing today, Apple announced that Luca Maestri has officially transitioned into the Chief Financial Officer and Senior Vice President role. His first official day on the job was yesterday, May 29th. Maestri is not yet on Apple’s executive biographies page, but an official profile will likely go live in the coming days. Apple says that Maestri’s previous job as Principle Accounting Officer will be folded into his CFO role.